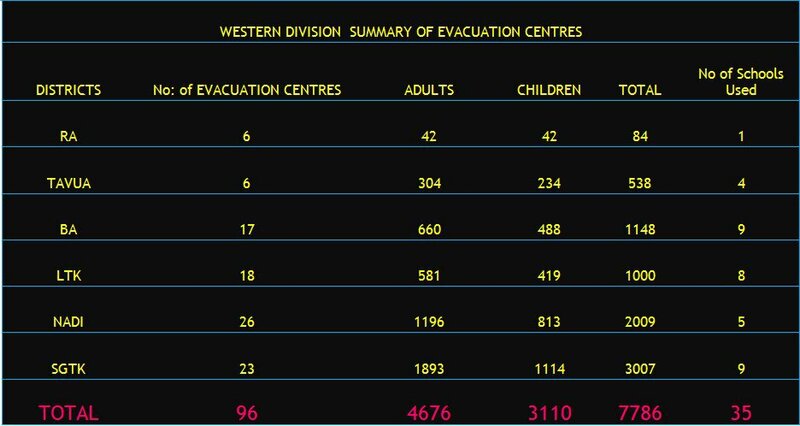 The state of natural disaster has been declared but specific information about the number of people affected continue to differ. The regime's spokesperson, Sharon Smith Johns, says the floods are now hitting the western and the central division, and that five thousand people have been evacuated with 62 centres operating. Is this logical since more people appear to be affected? 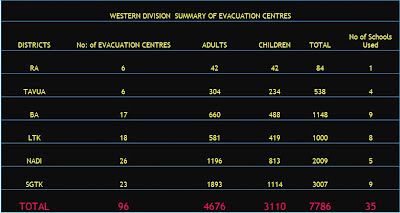 Media reports (some of them local) have said 8,000 people and 99 evacuation centres. Australian and New Zealand tourists are being told to stay home until Fiji is flood-free. The official death toll is said to be four. Bainimarama has called on officials to be prepared for the next spate of bad weather and not to be caught by surprise and has urged that people get enough food and supplies. The Fiji First Party says it has written to the illegal prime minister, Frank Bainimarama, suggesting he allocate $130m for Flood Relief Response and a Revamp of Sugar Cane Farming. It says: "Everyone is aware that skilled cane farmers have been moving out because of lease issues and past evictions. Once they move out they do not intend to go back, given it takes years of slow growth to accumulate the little that they have gathered collectively as a family unit. Without Government’s financial support right now directly to these victims, it may be too late for some cane farmers and other farmers and Fiji’s economy as a whole." io da sa veivuke tu ga ena masu. sa yaco tikoga na nona lewa na Kalou. kerea meda kua ni beitaki bai se o kean se o cei...me da masulaka ga na ka sa yaco tiko ena noda vanua. Best for you Indians to migrate, I don't think this racial issues will be solved. If you can move on, do so. Better sugar cane farming in Oz or somewhere and you don't get discriminated against. As for the sugar cane industry, there are thousands of unemployed itaukei roaming about aimlessly, FB and AK, what about putting up a scheme to attract the itaukei to sugar cane farming. @11.06 Sugar politics has ruined our country it is correct. But sugar cane proceeds was the first to go into governments income that was used in return to provide basic services and education to entire country. Without cane how many people's livelyhood will be destroyed? How many casual labourers who leave Naitasiri to work on these farms feed go out and work hard to earn pathetic income from it but still do it...because there is no other income source? And in that process to leave cane farmers to fetch for themselves will ruin not only cane farmers but trickling effect to entire economy. And become like Greece cannot pay back debts. If FIJI FIRST PARTY's suggestion is wrong then maybe Naitasiri and Nakelo should use their own money to fix the bridge or road or whatever ruin caused by the flood. Do you think there is a money machine for country to keep handing out to fix things? I am not talking about cassava gardens or dalo gardens here...it is "farmers" I am talking about. So without these farmers, bringing in much foreign reserves apart from earning an honest living... the money in the govt's till will be all gone to pay for your education and health. So there is nothing wrong in FIJI FIRST PARTY's SUGGESTION here. C4.5 please re consider publishing Fiji First Party's statement as it stinks like mud and this man has no mandate to speak on behalf of fiji people as he him self is hiding somewhere in nz.on what basis he is requesting govt to allocate $130M sala choooor himself. The warwar chief has ordered no more tourists to come to fiji and no more warning of floods coming like this time and all junta to come out with their begging bowl. Hey what's that white ray of light coming out of the water? who is this fiji first party -frank /ag party or who. 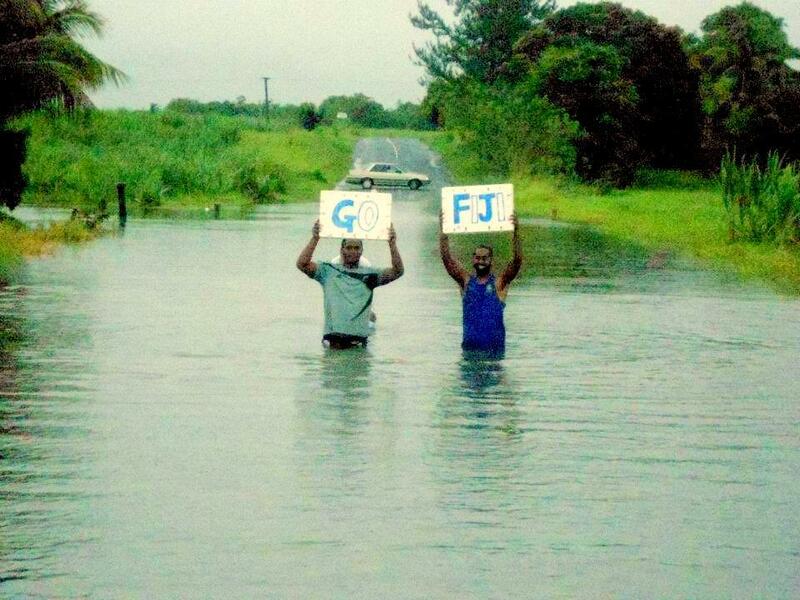 we feel sorry for the people of fiji. time for the regime to resign and hand over the power to legal govt . so they can get aid from donors. what a shame regime said its for fiji people but scared to help the people. no money .dont be ashame to ask for help from overseas govt. sa madua .forget the pride .fiji is doom. god is angry at the regime. restore back gcc.freedom for fiji people. And where exactly does this Fiji First Party think this 'kere kere' dictator will get $130 million from?? 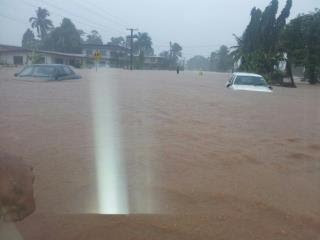 The white ray of light are the headlights of the Fiji navy submarine trying to detect the cause of the flooding. Who is heading The Fiji First Party? Vaya submarine, in another 50 years maybe..lol.Cud be those mini drone kind, and stealth too..a rauta back to the flood story! @anon 8.24....FIJI FIRST PARTY is not headed by anyone. It is not going to be a party that is recognised by a single leader. It wants 72 accountable leaders who can show that politicians to give their best shot are ready. It does not want to have a leader that is in control or ownership of the party. That after 20 years as leader still remains as leader after being thrown out more than once. At FIJI FIRST PARTY it seems YOU are the leader who wants to join them and become one of the 72 politicians who is not tainted with any corruption whether proven or unproven and where another politician/people has accused and where honors is on you to proof that is untrue. Yes I am interested. I know that I have lot to contribute to Fiji. E-mail me at FijiWala@Rocketmail.com with further information. Fiji First will be the next government and all the leaders will be a force to reckon with. Goodbye chod- dhary and sons limited. All good people with brains and who are not power hungry need apply to fijifirst @gmail.com and create a fiji with a new name: UTOPIA !!! We will no longer have to worry about who is or not a FIJIAN anymore.Bugger the European name given to this country. Lets change that and the way we do business.